My grandmother was a stern, fastidious woman. She had a live-in housekeeper, and her home was always tidy. She wore expensive jewelry and got her hair done professionally several times a week. She frequently sent back food at restaurants and would chew out waiters who brought her an imperfectly made Martini. So it was quite surprising to one day come across a black-and-white photo of her in her 20s. A huge smile lit her face as she tilted a high heel full of sloshing Champagne to her lips. It left me wondering, where did this strange practice come from? When exactly were you supposed to do such a thing? And how?! 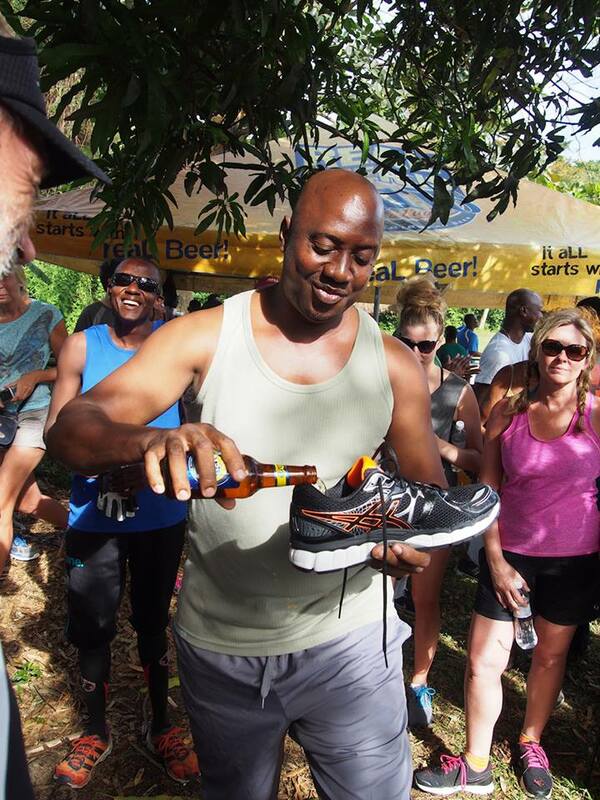 Practically speaking, using a shoe as a drinking vessel seems difficult to execute (heel or toe?). The strange, once-popular practice is said to be of Russian origin, dating back to the late 19th century. It was at Moscow’s Bolshoi Ballet where fans may have drunk, not necessarily Champagne, but vodka, from their favorite ballerinas’ satin slippers. By the turn of the century, the practice had spread to America — and notably to Chicago’s Everleigh Club, a brothel run by madam sisters Ada and Minna Everleigh. Theirs was a simultaneously decadent and depraved operation. The three-story Everleigh Club occupied a double mansion with a library, art gallery, ballroom, 50 bedrooms, and a good two dozen prostitutes always on call. There was a $15,000 gold-leafed piano, $12 bottles of Champagne (pricey for the time), and rooms with mirrored ceilings and $650 spittoons. It was also home to one of the most notable and reported-on drinking-Champagne-from-a-slipper incidents. The Everleigh Club was “the most famous and luxurious house of prostitution in the country.” So of course, when Prince Henry of Prussia came to America in 1902 on a business trip, he needed to find a way to discreetly visit. The Everleigh sisters were savvy enough to oblige, and quickly put together a banquet in his honor. In what is quite possibly an apocryphal tale, it is said the club’s best dancer, Vidette, was atop a mahogany table dancing to “The Blue Danube” waltz when it happened.“Her feet flying higher each time, legs meeting and parting like a pair of scissors possessed,” according to Karen Abbott, author of the 2008 book, “Sin in the Second City: Madams, Ministers, Playboys, and the Battle for America’s Soul.” Eventually one of Vidette’s high-heeled silver slippers dislodged from her foot, flying across the room, hitting a Champagne bottle, and spilling some into the shoe. Irving Wallace envisioned a slightly less raucous version of this incident in “The Golden Room,” his 1990 novel about the Everleigh Club. “With Minna’s shoe in hand, the prince came to his feet and poured champagne into the slipper. ‘A toast!’ announced Prince Henry,” Wallace wrote. However the logistics, wherever it originated, and by whom, most believe that Prince Henry’s Everleigh Club incident kickstarted a nationwide sensation. Drinking Champagne out of women’s shoes was going viral in the age before Twitter and Instagram — soon everyone was participating. And why not? It was a great party trick, it was a lavish way to get loaded, and it was one helluva flirtation tactic. Soon, all the hippest celebrities were partaking in the practice. “Back in Lillian Russell’s day, no actress possessed the real spirit of the theatre if she didn’t periodically dance on a supper table and drink Champagne out of a slipper,” wrote society writer Beaucaire in a 1941 edition of Argus. 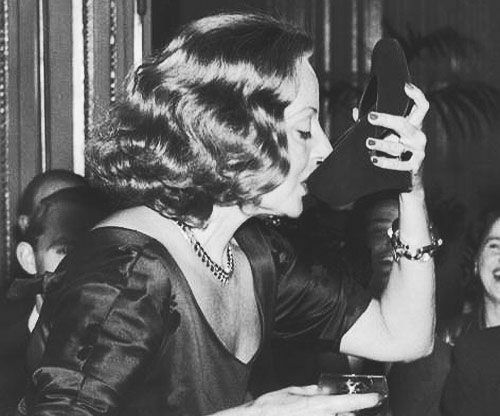 And movie star Tallulah Bankhead famously sipped Champagne from a chocolate suede slipper during a 1951 press conference at London’s Ritz Hotel. Drinking from a shoe eventually spread to other countries, footwear, and beverages. Ukrainians would steal a bride’s shoe to slug vodka. German soldiers were said to drink beer from each other’s boots to bring luck before battle — or perhaps celebrate victory after it. Aussies have long employed a practice called the “shoey,” which consists of slugging cans of beer from their buddies’ sneakers. This is similar to the rugby tradition of “shooting the boot,” a hazing ritual in which a young player has to drink from his dirty cleat at the post-game celebration. The sports world particularly enjoys the practice, with everyone from auto racers to basketball fans to even joggers using their appropriate footwear and beverage choices for the attempt. Unfortunately, Champagne-filled high heels mostly petered out of American nightlife by the end of the 1950s. Today when people at bars drink out of a shoe it’s mainly planned and mostly sanitary. 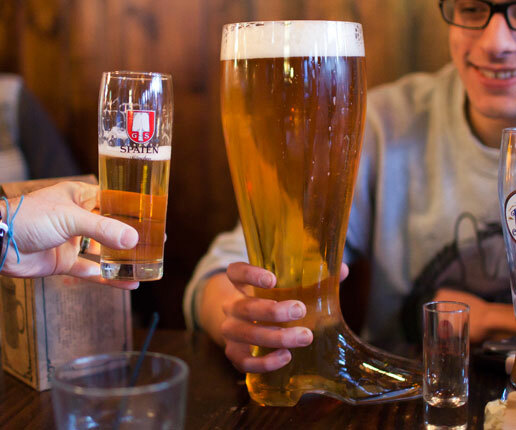 Many American-style German beer halls now offer Bierstiefels, the so-called “das boot,” a heavy, glass-shaped boot able to hold several liters of beer. You typically have to lay down a credit card for the privilege as insurance should you accidentally break it. Not exactly as free-wheeling and fancy-free as in Tallulah Bankhead’s day. A 1999 collaboration between Christian Louboutin and Champagne Piper-Heidsieck featured a bottle of bubbles and impossibly high heel. Yet the concept never truly leaves us. Every few years, someone somewhere attempts to revive it. In 1999, in one of the stranger alcohol collaborations of all time, Christian Louboutin and Champagne Piper-Heidsieck created a package containing a bottle of the latter’s bubbly and the former’s crystal-heeled shoe. Sold exclusively in select Neiman Marcus stores, it was dubbed Le Rituel. A few years later, British designer Rupert Sanderson teamed with Perrier-Jouet to launch The Rupert Sanderson Champagne Slipper, a silver-plated crystal Champagne glass shaped like a (very) high heel. Yes it’s “a thing.” It’s always been a thing. And, hopefully, in a minor way, it always will be.